U.S. sanctions against several Russian companies have prompted Moscow to take action by resorting to the World Trade Organization as an international arbiter in the dispute. The Russian authorities, which may launch a lawsuit against the U.S., insist that the sanctions contradict WTO norms. In response to U.S. sanctions against a number of Russian companies, including media tycoon Yury Kovalchuk’s Bank Rossiya, Russia has decided to take action via World Trade Organizationmechanisms. According to Russian officials, the U.S. sanctions violate the rights of Russian suppliers of services that operate in the U.S. or trade with American companies. This constitutes a violation of one of the WTO's basic agreements, the General Agreement on Trade in Services. Under WTO rules, a country can impose restrictions on the export of goods and services for national security reasons, but they do not envisage the option of sanctions. Russia joined the WTO in August 2012, after 18 years of talks. Russian authorities have released a communique accusing the U.S. of failure to fulfil its trade obligations. Furthermore, as announced by Russian Economic Development Minister Alexei Ulyukayev, the U.S. may face an additional lawsuit. In addition, a dedicated body will be set up to defend Russia's rights at the WTO. In late January, Russia's biggest retail bank, state-owned Sberbank, together with the Economic Development Ministry and the Moscow-based Higher School of Economics, announced the establishment of an expert center on WTO issues. The independent non-profit organization funded by the country's biggest bank will provide advisory services to the Russian authorities and businesses on cooperation with the WTO. The first to benefit from the experts' advice may be the Russian gas giant Gazprom, whose interests will be directly affected by the EU's "third energy package", which Russia continues to oppose. Under that document, Gazprom will not be able to supply gas to European countries and continue to own its gas pipelines. The U.S. is not Russia's only opponent inside the WTO by far. Russia filed its first World Trade Organization suit against the European Union in late December 2013. The action concerns so-called energy adjustment tariffs, which push up the price of Russian goods on the European market. In particular, European countries accuse Russia of taking advantage of what they see as an unfair advantage, that of cheap natural gas. In order to offset this factor in the price, they use energy adjustment tariffs as part of anti-dumping proceedings. These measures are applied mainly against Russian metals and chemical enterprises. For their part, the Russian authorities consider cheap natural gas to be Russia's objective advantage and anti-dumping cases an unfair mechanism used by the EU to protect its own producers. Another case has been initiated by Russia against China. It concerns the prices for steel seamless tubes that are used in oil drilling. The suit was filed by Russia's leading metals manufacturers, including the Chelyabinsk Pipe Rolling Plant, the Volzhsky Pipe Plant, and the Seversk Pipe Plant. The plaintiffs believe that China has increased its share of steel pipe imports from 28.2 to 55.4 percent through underpricing. Chinese companies' dumping prices resulted in the return on sales within the Customs Union alone in the first nine months of 2013 dropping threefold compared to that for other market players, and profits were reduced by 62.8 percent, Oleg Kalinsky, head of the pipe industry development fund, told RBTH. 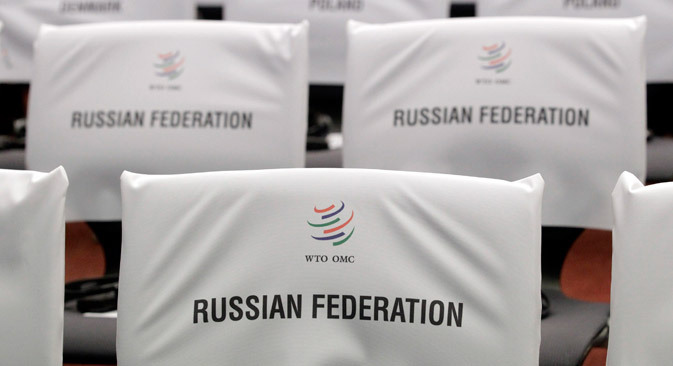 Generally speaking, Russia is only starting to develop ways of protecting its domestic companies' interests within the WTO, a source at the Russian Union of Industrialists and Entrepreneurs told RBTH. Moreover, other countries are now retaliating with suits of their own. For instance, since late January 2014 the EU has already initiated 12 WTO probes and promised new suits against Russia. In particular, in April the EU complained against Russia's ban on pork supplies from Europe.